1) I went to Lulu B's. More on #1 in a sec. After the promise of rain by the local weather forecasters during the passage of 4 hurricanes this summer & fall (Dolly, Felix, Gustav & Ike), and how they were wrong EACH time, we finally got measurable rain today! I think I may have close to an inch at the house. Now, if only the humidity would go away, and we could really have a "fall." Back to LuLu B's. I basically pass it twice a day on my way to & from work. 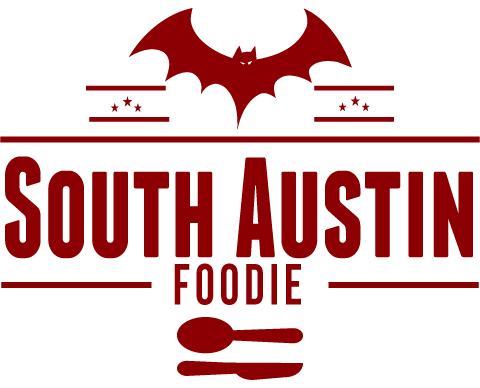 It is a trailer, serving a limited Vietnamese menu, that is literally sandwiched between Austin Quality Tires and Office Depot, just south of the Lamar & Oltorf intersection. The trailer sits under a giant live oak tree, which provided me coverage as the drizzle started up again just after 2 pm today. 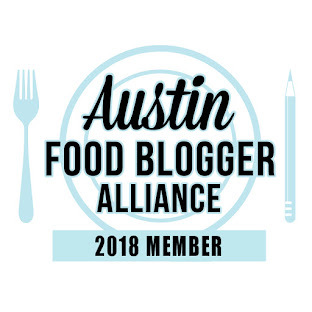 Their menu consists of bahn mi -- the legendary (and elusive in South Austin) sandwich of French influence; bun, or vermicelli bowls, and summer rolls. I had the Chinese BBQ pork sandwich, and after asking the guy at the counter for his recommendation, he suggested the chicken lemongrass vermicelli bowl. They've got several gently used tables and chairs out under the live oak, each with bottles of sriracha and sambal oelek for the heat-seekers. I got my food, and headed home, getting a bit of a free carwash in the process. 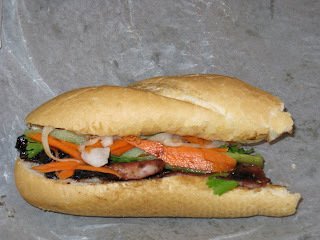 The bahn mi was simply fantastic. Tasty pieces of beautifully char grilled (but not burnt) pork, which have a nice subtle sweetness to them. I could eat that pork every day! The relatively tender (as in, not too crusty) French bread is stuffed with the pork, thin strips of carrots, daikon radish, cuke, cilantro and either a jalapeno or serrano (it was fairly hot!). Absolutely stunning in looks and taste, and at $4.50, extremely worth it! The picture you see here is the other half of the sandwich, which I am about to eat for dinner! The bun was good, though not as outstanding as the bahn mi. The lemongrass chicken has nice flavor (props to the guy at the counter); often you order a lemongrass dish, but it barely has a lemony flavor, much less lemongrass. This hits it. 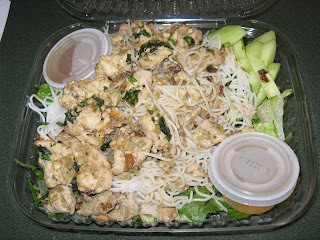 The chicken is on a bed of romaine and vermicelli noodles, with cilantro, maybe some basil (? ), chopped peanuts, and a fish sauce dressing on the side. Overall, it's missing a pop though.... I think it needs lime juice. But it's very fresh, quite healthy, and I will happily return!